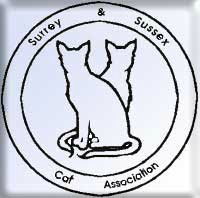 The first reference to the formation of a cat club specifically aimed at the counties of Surrey and Sussex appears to have been with the circulation of some 200 letters raising the idea, and following that an inaugural committee meeting was held on 20th April 1950 – the first entry in a succession of Minute Books. Present on this occasion were Mrs Effie Aitkin, Mr & Mrs Carman, Mr & Mrs Knight, Mrs Vize and Miss von Ullman. Among the many items discussed, our current Show Managers will be charmed to hear it was suggested that a show a month should be held!!! Eventually a General Meeting was arranged on 8th June 1950, at the somewhat grandiosely named Café Royale in Croydon, with some 25 people present, thus Association came into being. There was at this time an inordinate amount of time and discussion given to the choice of a president, and every committee meeting produced yet another list of suggestions – ranging from Beverly Nichols to the local vet! I have not yet found a reference to the final resolution of what was obviously a knotty question. Our first show was provisionally booked into the Coleman Institute Hall, Redhill, for the princely sum of £4.4.0 (Four guineas in old money!). Date was to be 10th January 1951. It was suggested that 2 judges be booked, one for Long Hairs and one for Short Hairs and household pets. Mrs Cooke-Radmore was invited for the Long Hairs, and Mrs Elsie Towe for the Short Hairs. Later AGM Minutes refer to the show accounts, and report a grand profit of one pound ten shillings and four pence - £1.52 for the benefit of post decimalisation persons. The meeting also reported enrolling 78 members in their first year, and interestingly they then also had ‘local branches’ run by local secretaries. The Association’s first Exemption show appears to have been in 1957/8 in Epsom and one of the committee promised to arrange for some gramophone music.